It started as a simple question  on social media: What would happen if adjuncts across the country walked out on the same day, at the same time? That question got answered Wednesday -- sort of -- on the first-ever National Adjunct Walkout Day. There were some big walkouts at a few institutions but, for a variety of reasons, adjuncts at many more colleges and universities staged alternative protests, such as teach-ins, rallies and talks. Still, the movement led to unprecedented levels of conversation on many campuses, in the media and elsewhere about the working conditions of the majority of college faculty (those off the tenure track). And as a result, adjunct activists declared the day a success -- while wondering what comes next. For large-scale protests, the place to be Wednesday was the West. Many adjuncts, along with student and tenure-line faculty supporters, walked out of their classes around noon (those who had classes then) at Seattle University, San Francisco Art Institute and the University of Arizona. The movement will be discussed Friday on "This Week,"  Inside Higher Ed's free news podcast. Sign up here  to be notified of new "This Week" podcasts. Larry Cushnie, an adjunct professor of political science at Seattle, said hundreds of non-tenure-track and tenure-line faculty and students participated in the walkout on his campus. “It was fantastic,” he said, describing the protest as a “picket line of sorts that went across campus, with hundreds of people holding signs.” The walkout ended with six speakers, including adjuncts and tenure-line faculty, talking about the importance of job security, institutional support and fair pay for adjuncts. Of particular import was job security, he said, since “a human being needs to know what they’re doing for work more than a semester ahead.... That’s just not a tenable way to live,” or teach. Cushnie was scheduled to teach a class on activism, protest and the law at the time of the walkout, and extended an invitation to a “voluntary field trip” to his students. Many of them showed up. Cushnie attributed the success of the walkout to the Jesuit institution’s social justice tradition, saying the goals of the movement weren’t “very far afield from what's important in the mission of the university.” Adjuncts at the university also have battled with the administration as it seeks to block their attempt to form a union  affiliated with Service Employees International Union. Cynthia Diaz, a sophomore at Arizona, didn’t know anything about adjunct pay until a rally organizer there contacted her last week. She said she was focused on her classes and making good grades. While she appreciated her professors and looked up to them, she said, she never took the time to think about their work conditions. She spoke at the rally on campus Wednesday that organizers say drew nearly 300 people, many donning red T-shirts demanding a living wage for adjuncts. Diaz said she plans to continue to organize student support for the adjuncts’ cause. Lisa O’Neill, a writing instructor who’s been teaching as an adjunct for five years at Arizona, helped organize the walkout day events. The faculty is not unionized. Adjunct faculty in the English department teach more than 100 writing courses to 2,500 students each semester, according to a letter  nontenured faculty sent to Arizona President Ann Weaver Hart. Despite teaching full-time, those instructors earn a total of $33,050 a year. O'Neill didn’t have a class scheduled on Wednesday. Instead, she spent all her Tuesday classes talking about adjunct pay and workload. Other instructors did the same, some brought their classes to the rally and some did cancel classes, though O’Neill wasn’t sure how many. Tom Miller, vice provost of faculty affairs, said the Arizona administration and the Faculty Senate have been working on issues surrounding adjunct instructors for the past three years. At San Francisco Art Institute, the march through campus and subsequent rally -- for which some students and faculty members missed their early afternoon classes -- were student led. Ross McKinney, a fourth-year student leader in the protest, said he was driven to participate out of concern for his instructors. He said he’s only had five nonadjunct instructors during his time studying film and photography at the institute, and that many of his favorite instructors have left in search of jobs with better pay, benefits and job security. The protest at the art institute -- where adjuncts are hoping to negotiate their first contract as part of an SEIU-affiliated union -- attracted participants from other area unions, including those that represent nurses and fast-food workers, as well as faculty from the City College of San Francisco and San Francisco State University. Jessica Beard, an adjunct instructor of English at San Francisco State as well as the art institute, estimated there were up to 80 people involved at any given time, from student printmakers creating protest posters to tenure-line faculty members speaking in solidarity with their non-tenure-track colleagues. Beard said organizers would have liked to see everyone walk out of their classes, but it became clear in planning that not enough students or members of the public knew enough about adjunct faculty employment conditions to support the move. So adjuncts instead focused on a march and rally to educate the public, for which some faculty members and students missed part of class. On other campuses, there were some “lone wolf” walkouts and class cancellations by adjunct and tenure-line faculty alike. Katherine Fitzgerald, an adjunct instructor of philosophy at Jefferson Community College of the State University of New York, in Watertown, said she tried to recruit other adjuncts to organize an educational protest about adjunct faculty issues. But her colleagues were either unaware of the larger concerns surrounding adjunct faculty employment or too concerned about job security to participate, she said. Fitzgerald canceled her two Wednesday classes and let her administration know what she was doing. “This really became a personal issue for me,” Fitzgerald said, “you know, ‘Am I going to express myself or not?’” She said she thought she had the “silent support” of her colleagues, and even members of her administration. She said she hoped she wouldn’t be punished under New York’s Taylor Law prohibiting public employees from striking, since her protest was part of a national day of action against structural problems in higher education that adversely affect student learning -- not a day off or a more traditional strike. Jessica Rett, associate professor of linguistics at the University of California at Los Angeles, officially canceled her class  Wednesday in observation of walkout day. At the University of Maryland at College Park, the entire women’s studies faculty -- both tenure line and non-tenure track -- scheduled a required furlough day to coincide with the walkout. Ashwini Tambe, an associate professor in the department, said there was general agreement among the faculty that the “division between tenured or tenure track and an adjunct is an artificial one, in that we don’t see adjunct faculty as the enemy and that we are not immune from some of the problems they face, since tenure as an institution is under a great deal of threat right now.” Tambe also said she thought that women’s studies, which pays much attention to labor and wage inequality, was a particularly “hospitable” discipline to the concerns surrounding walkout day. Soon after the walkout day idea started to take off in October, many adjuncts began to talk about the fact that their union contracts or laws in many states -- or both -- prohibited them from striking (some unions, such as SUNY’s United University Professionals, actively discouraged members from walking out, citing the Taylor Law and contractual no-strike clauses, while stressing support for the cause). Other adjuncts said they philosophically opposed walking out of class, or were too afraid they would lose their jobs if they did. So most of Wednesday’s actions weren’t walkouts at all, but other forms of protest, such as teach-ins and rallies. At the University of North Carolina at Chapel Hill, for example, participants read statements about adjunct working conditions at a midday rally. Robert Porter, a longtime non-tenure-track instructor of African-American, African and diaspora studies, talked about his lack of job security, even though he’s won teaching awards and performs regular service on campus. He also talked about the gender issues inherent in the adjunct faculty debate, with women making up a disproportionate number of adjunct faculty members, especially in the humanities. Porter said the rally attracted about 90 people, adding that he was most “struck” by the level of anxiety about job security. “There were a lot people there who did not identify as adjunct faculty,” and instead relied on tenure-line faculty members and undergraduates to read their statements, he said. Recurring themes resonate with adjuncts’ concerns nationwide: a desire for better pay, job security and respect that’s not afforded them in the current faculty “caste” system, Porter said. At George Mason University, Wednesday’s movement helped a new contingent faculty group gain traction. The Mason Coalition of Academic Labor officially formed last semester, when members released a petition  asking for office space and payment for course preparation. A member, Basak Durgun, a graduate student in cultural studies, said she doesn’t expect backlash from the administration over the petition or a teach-in and panel discussion members hosted Wednesday. But she said that’s always a concern when there isn’t any job security. Risk aside, the group already feels that it’s having some sway on campus. About 30 people attended the sit-in Wednesday. And last week, S. David Wu, provost and executive vice president, held a meeting with some adjunct faculty members, though not specifically with the coalition. Afterward, he announced the formation of an adjunct task force to explore policies and best practices. “George Mason University’s administration is aware of the national conversation about adjunct faculty and is committed to being a leader on this issue,” Wu said in a statement. 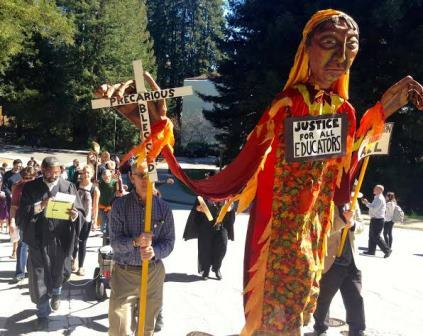 One of the more creative protests happened at the University of California at Santa Cruz. Non-tenure-track faculty members there are about to open up their American Federation of Teachers union-affiliated contract negotiations with the university, and so marched across campus and sang songs with the fictional “Saint Precaria” puppet to highlight their platform -- specifically better job security for adjunct faculty members who have not yet earned longer-term contracts. Roxi Power, a lecturer in writing, said Santa Cruz always has been one of the “quirkier” California campuses, and the idea fit. She said she also hoped the catchy symbol would highlight the relative strength of the non-tenure-track faculty contract for faculty members nationwide who are only beginning to organize. Several other walkout day events took place on campuses throughout California. 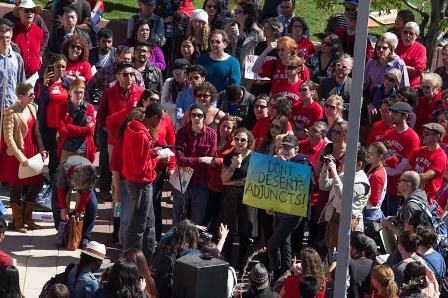 About 70 people, mostly students, marched across the campus of the University of California at San Diego and attended a teach-in that focused in part on how the reliance on adjunct faculty affects academics. And the California Part-time Faculty Association, a nonunion group, helped organize meetings with 35 instructors and students from community colleges with 12 legislators, where they talked about job security, paid office hours and pay equity. Part-time instructors at California’s community colleges earn 50 cents for every dollar that full-time faculty get, said John Martin, an adjunct instructor of history at Butte and Shasta Colleges. “This is the first action organized by part-time faculty for part-time faculty,” he said. Many campuses with American Association of University Professors-affiliated unions and advocacy chapters held awareness events highlighting AAUP’s One Faculty  campaign in support of all faculty. The University of Illinois at Chicago, where the faculty union is also affiliated with AFT, held a panel discussion on adjunct faculty issues in partnership with the School of the Art Institute of Chicago. 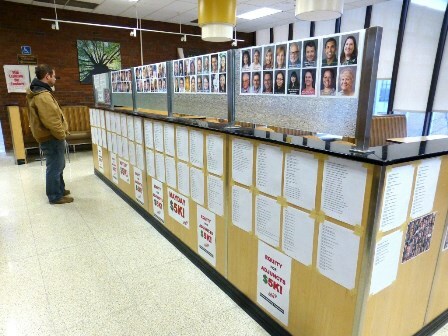 Dozens of other campuses held similar events, such as SUNY New Paltz’s UUP chapter, which put up a display this week showing the faces of the university’s more than 100 contingent faculty members. The Modern Language Association (whose members include those on and off the tenure track) also got involved with an Action for Allies  campaign, in which the group asked tenured faculty members to pledge their support for adjuncts and schedule meetings within their departments to discuss the role of contingent faculty. 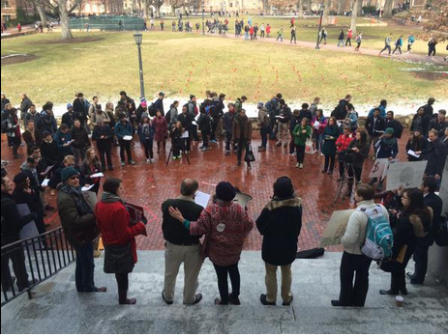 As of Wednesday evening, more than 650 faculty members had signed up as allies. Walkout day participants also got a Congressional shout-out on Twitter  from Democratic members of the House Committee on Education and the Workforce, which has begun to show formal interest  in their cause. The movement got a boost from abroad, too. Adjuncts in at several institutions in Canada, and the faculty union for Quebec, FNEEQ, expressed solidarity with their colleagues in the U.S. via posters or asking faculty members to observe a moment of silence in their classes on Wednesday, among other actions. In addition to Canadian part-timers, some adjunct faculty members in the United Kingdom and Ireland also tweeted messages of solidarity to U.S. adjuncts. National Adjunct Walkout Day was originally proposed on Facebook and Twitter by a lecturer in writing at San Jose State University who has chosen to remain nameless. Via e-mail Wednesday, she said that even though the walkout turned out to be more of a protest than a strike, it accomplished all the movement’s original goals. “National Adjunct Walkout Day has been a success... in raising awareness, providing a network for adjuncts to connect from campus to campus, getting allies (students, faculty, departments or professional organizations such as the MLA) involved, uniting adjuncts not only in the U.S., but also in Canada, generating lots of discussion about adjunctification, and garnering local and national media attention on the adjunct issue and how it impacts higher ed,” she said. Participants in Wednesday’s protest agreed, saying it was now time to think about what’s next. Beard, of the San Francisco Art Institute, said Wednesday’s activities revealed a possible citywide organizing base that can keep educating the public about structural issues in higher education -- maybe enough to hold an actual walkout sometime soon. “I’ve been dreaming of this since I was in graduate school, when graduate students were bargaining with the university over our wages, hoping that one day we could actually show how important our labor is by not participating,” she said.